We had a lovely trip to Beijing, though the housing situation was less than ideal. At first, the four of us were in one hostel, but Deborah and I decided to move to a (cheaper) hotel where the room promised to be a little warmer and the smell of sewage did not permeate the air. [The overall air quality of Beijing during our visit was tolerable. We really lucked out, in that respect!] Our two friends continued to brave it at The Three-legged Frog, where the people were very nice and the service was good. It was, in fact, a fairly charming place and would probably be wonderful in the warmer months. We arrived in Beijing on the morning of February 9th. The TV show that the whole country tunes into begins around 8:30PM and goes well past midnight. We shivered in our room after a nice day of wandering about Tian'anmen Square and the Quianmen area. 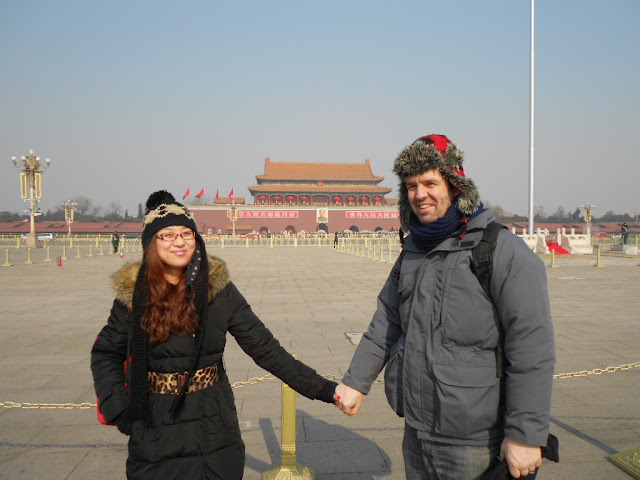 The pictures below show Deborah and I in front of the Great Hall of the People, in front of Tian'anmen with Mao's mug betwixt us, in front of the first movie theater in China, and finally in front of the original Quanjude Peking Duck restaurant. We would eat there later that evening and one of our number won four boxes of monogrammed chopsticks by participating in a dumpling stuffing activity. It was very cold for Beijing and this cat had found a warm manhole cover seeping with steam. On the last full day there, we also went for a swim in the WaterCube. 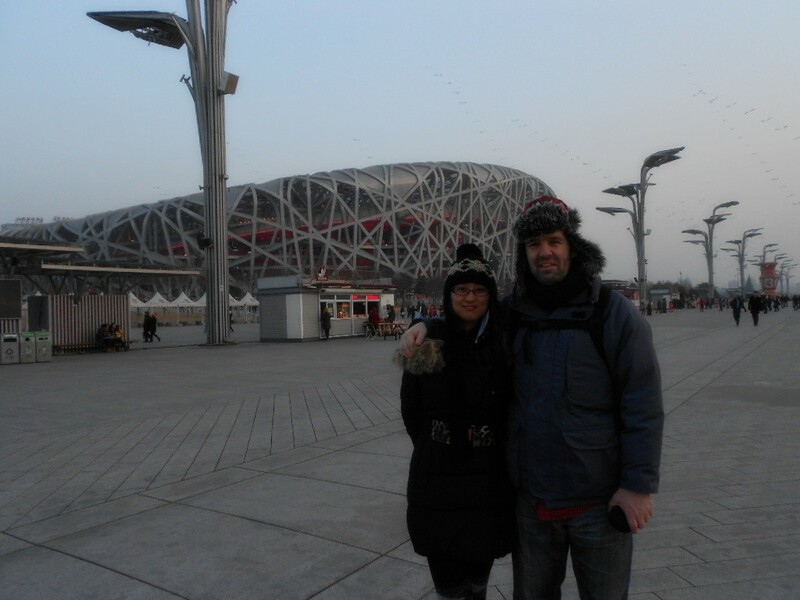 There are no pictures of that (thankfully), but here we are standing in front of the Bird's Nest, designed by Ai Weiwei for the 2008 Olympic Games. While our companions went to the most touristy, accessible section of the Great Wall at Baodaling, we toured the campuses of Tsinghua University and Peking University. This is me in front of the Peking University Law School. Deborah and I were both impressed by the large number of bicycles. "It's like the olden days," she remarked. The best part of both campuses were the lakes. I had seen the one at Peking University on my summer trip, but the skating scene at Tsinghua University was positively out of Currier & Ives. The red litter comes from the abundance of fireworks lit off at this time of year for celebration of the new year (look for a post soon on the Year of the Snake). We saw an amazing show of Chinese acrobatics called Legend of Jinsha. The most impressive segment included five motorcyclists barreling around in a steel ball. 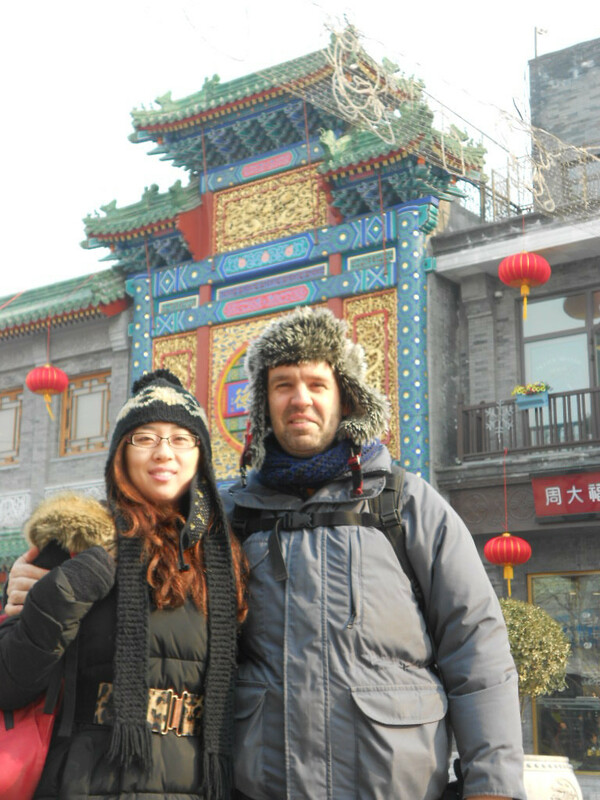 When we arrived on the 9th, Qianmen was dead. I felt sheepish that so many things were closed, but the days ahead saw an explosion of people and we estimated that there were 500,000 people in Tian'anmen on the 13th of February. With security such as it is in the square, I could not get enough height to really show the magnitude of humanity waiting in various queues. 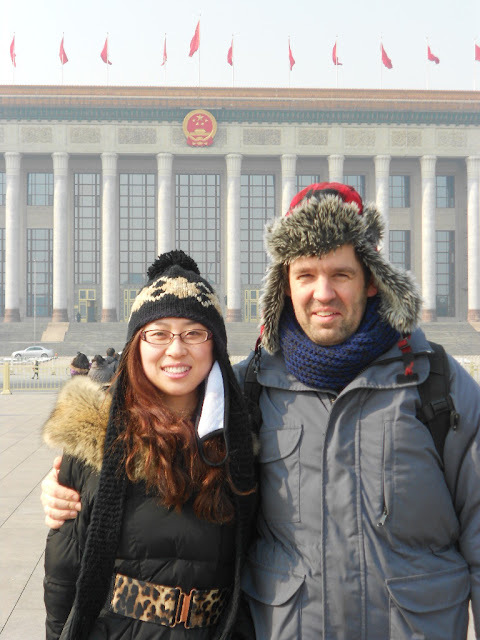 A small section of Tian'anmen Square on Feb. 13, 2013. 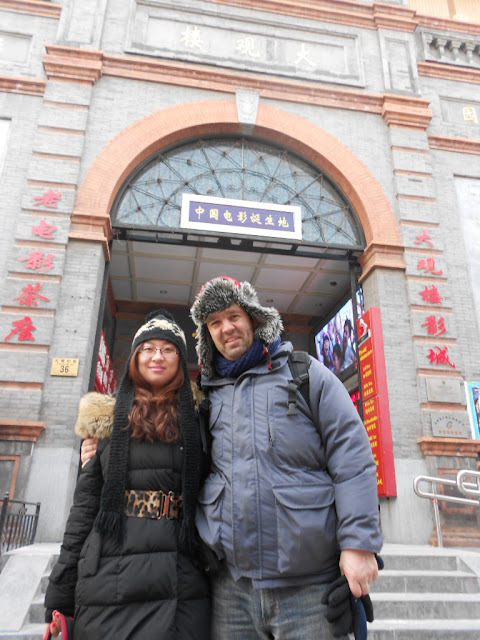 The crowds at Qianmen (next to Starbucks) on 2.13.13. Many people in China have no shower in their apartment still so they make a weekly sojourn to the public bathhouse. As I have, for months, had the chance of getting a stream of electricity when taking a shower in my own apartment, I have "turned Chinese" and last night I went to one of the finest bathhouses in the city. One must be careful in choosing a place, I am warned, but there did not seem to be anything shady about the place I went. You walk through the revolving doors and are handed a key on a bracelet. You remove your shoes and tread gingerly in blue flip-flops (red for women) to the locker-room. Your key has a number on it which identifies the correct locker. You remove your clothes and place them inside and then proceed to the showers. Anyway, I digress. Back to the bathhouse. You enter the humid shower room at this particular place, where everybody is naked, and there are nine or ten men lying face-down or face-up on tables being scrubbed by old men whose job it is to slough skin from the clientele all day. I skip this procedure, but avail myself of the shampoo and soap that is included in the 58RMB price.There are probably thirty showers. At any one time, five or ten men lounge in a couple pools of hot water and very hot water. After cleaning myself, I went immediately to the hottest one. I turned red like a lobster and my heart started to pound. I glanced around furtively to see if the other occupants were also turning colors, but I seemed to be the only one. Not wanting to expire, I got out and went to a special shower, akin to what you might find in a laboratory, that rains cold water down on you for a few seconds. Then, in my flip-flops, I plodded up to the mezzanine where there are three sauna rooms. (It seems, at least, that saunas are safe for the healthy among us.) One room was dry; one, tolerable; and the other a steam room infused with the odor of a bag full of potpourri. I spent a few moments in each, more like a tourist than an experienced Roman. (My girlfriend and I had just watched Spartacus  the previous night.) There was no clock in the place, which contributed to the pace with which I cycled through the various activities. I had planned to meet my girlfriend upstairs at 8:20 when she was done on the ladies side. To meet her, obviously, I had to put some clothes on. When you step out of the shower room, there are piles of brown towels and stacks of silk pajamas. I pulled on a set and clopped upstairs to wait for her. I was still red and my heart was still pounding so I asked an employee to open one of the locked refrigerators and bought some coconut milk to replenish myself. She did eventually show up, but had been waiting for me on the third floor while I lounged on the second. We wandered around the rest of the premises. There were about five more co-ed saunas and oodles of tables with old people and twenty-somethings drinking tea or playing cards or chatting on their cell phones. You could get a full-body massage or a foot massage and watch a TV channel of your choosing while a man worked oil into your soles. You could eat a meal in a cafeteria and even buy women's shoes. Altogether, it was quite an experience that will be repeated many times, because four electricians have not been able to discover why there is electricity in the water that comes from the shower. It is not the hot-water heater, which I leave unplugged when showering. It is not the fan, which I leave turned off. It may be that the building is not properly grounded or maybe just my apartment. Nobody seems to know. Another foreign tenant, who lives on the other side of the building and down a flight, also has periodic experience with getting juice (of the electron variety) in the shower.